Cross Forest is one out of six cultural pilgrim routes analysed within the framework of the project Cultour+. Project Cultour+ No. 2015-1-ES01-KA203-016142 “Innovation and Capacity Building in Higher Education for Cultural Management, Hospitality and Sustainable Tourism in European Cultural Routes” is an Erasmus Strategic Partnership of universities, local governments, SMEs and NGOs, that, following the mainlines of the Higher Education Modernisation Agenda, will offer high quality and innovative tools and courses based on innovation, international mobility and cross-border cooperation to enhance capacity building in higher education curricula in the fields of cultural tourism and hospitality, cultural management and shared cultural heritage. Pilgrim route Cross Forest also called Cross Peak is one of the largest religious centres in Bulgaria. This place, called in Bulgarian Krastova Gora or Krastov Vrah, is considered by the Bulgarians as their own “Rhodope Jerusalem“. The aim of this research is an assessment of the possibility for sustainable development of tourism in Bulgaria by developing cultural pilgrim routes. Cross Forest is a religious complex of two churches, namely the old one (“Holy Trinity”) and the new one (“The Shroud of the Virgin Mary”) 12 Chapels of the Holy Apostles, the spring “Galabichkata” and various monastic buildings. Cross Forest, one of the biggest Bulgarian Orthodox sanctuaries, is located 6 km from the village of Borovo, and less than 2 km from Mostovo, high on the mountains, at an altitude of 1545 meters. The panoramic view on the sea of mountain ridges and peaks is breath-taking. The Rhodope mountain peaks that can be seen in the distance are Persenk and Perelik, Rojen and Prespa, Maragidik and Karlak. And as if it is not enough Bulgarian nature will fascinate you once again if you visit the Wondrous Bridges and Pamporovo, Haidushki meadows and the Smolyan lakes. Traveling around the Rhodope Mountain you will be charmed by Bulgarian hospitality. People living in this sacred place “that has kept the talent and the beauty of a whole generation of architects weaved into the Rhodope house and song, into the Rhodope embroidery and textile that had bound together in a sacred union the rock and the wood, the joy and sadness, the enchantment and brilliance”(Archimandrite Visarion, Sermon about Abbot of the “Holy Trinity” monastery at Cross fore, http://www.crossforest.com/ (10.10.2016)), inherited the faith and strength of the will of past generations. There are two main ways to reach this holy place. The one is from Asenovgrad and the other is from Vrata and Mostovo. 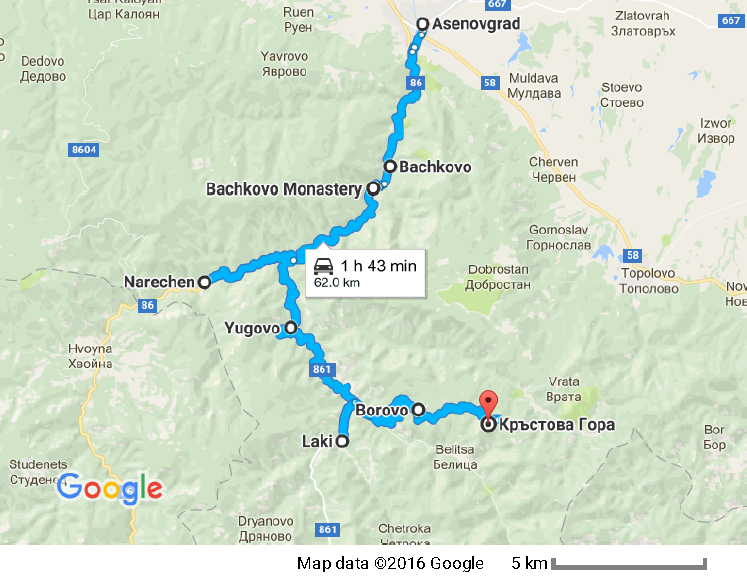 You can reach Cross Forest by car or by bus,travelling on the road from Asenovgrad to Smolyan. When you pass the Bachkovski monastery you get to the road fork for the town of Laki, namely – The Yugovski small inn. About 2 kilometres from Laki, turn left towards the village of Borovo and in 6 kilometres following the road you will get to the Cross Forest. (see Figure 1 and 2). You can reach Cross Forest on foot as well, walking on a pretty well-marked mountain trail from Mostovo. You just have to follow exact marks. 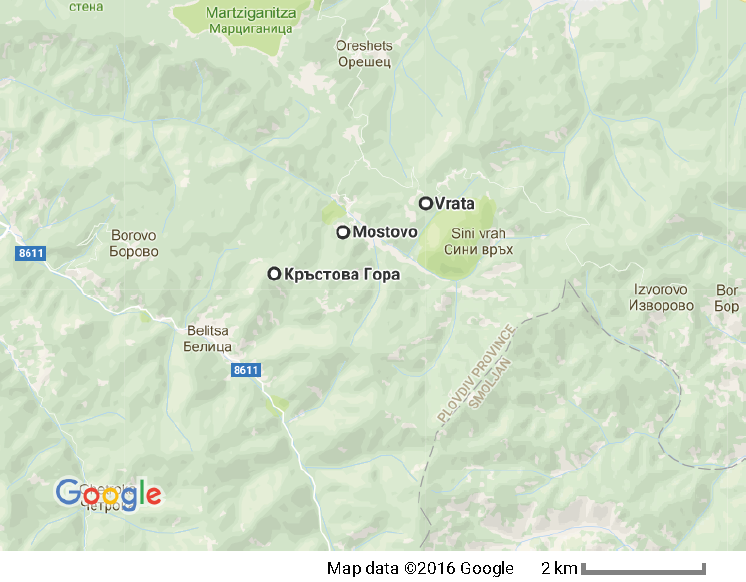 In total the distance from Vrata through Mostovo to Cross Forest is less than 3 km. Be aware that this is mountain trail and you are going to need a lot more time to reach the final point. (see Figure 3). A closer look at the history documents shows that even the Byzantine chroniclers had named the Rhodopes “Magna silva bulgarica – The Great Bulgarian forest”. In the book of law of the Bachkovo monastery founded in 1083 by the great steward of the Byzantine Empire, the Georgian Gregory Bakuriani wrote: “I gave the monastery two icons made of golden alloy and parts of the holy Christ’s cross. The bigger icon was called “Holy transfiguration of God” and the smaller one “Holy Virgin””. The legend also says that in the Cross Forest is buried a piece of the cross on which Jesus Christ was crucified. In 313 Constantine the Great defeated Maxentius putting an end to the short-lived Tetrarchy of the Roman Empire; he then gave equality of Christianity to all other religions. To celebrate the victory of her son, Tsaritza Helen decided to build the impressive temple “Holy Resurrection of Christ” on Golgotha Hill (Calvary Hill) where Christ was crucified. While digging for the foundations she discovered three crosses – Christ’s and those of the two robbers. They looked so similar and no one was able to say which one was Christ’s. Meanwhile a funeral procession was passing by. Tsaritza Helen stopped the procession and touched the dead body with the first and the second cross. Nothing happened. But when she touched the deceased with the cross on which Jesus Christ had been crucified a miracle happened: the dead man came back to life and stood up. People embraced and started to kiss Christ’s cross. Thus, the cross became a symbol of salvation for the Christians, and with it they defeated every form of evil. That happened on the 14th of September – the day appointed for worshipping the Holy Cross and named Adoration of the Holy Cross. Every year on the 14th of September the Holy Cross was taken out for pilgrims and many sick people who sought God’s grace seemed to receive it. At some point, in order to facilitate pilgrimage, Christians decided to divide Christ’s Cross in three parts: one remained in Jerusalem, another one was sent to Rome, and the third part arrived at Constantinople (Istanbul). The part that was given to the Patriarchate of Constantinople was put in a special chest, covered with gold and silver. And when the Ottomans conquered Constantinople in the 15th century, they took the chest with a piece of the cross as a war trophy. When the monks from Bachkovo’s monastery “Virgin Mary” found out what happened with the chest, they tried to buy it back offering a considerable amoun of gold to the Sultan. The monks received the chest with the Holy Cross in the monastery of Bachkovo. But as we know, the monastery in Bachkovo as one of the richest monastery in Bulgaria, was burnt down and robbed many times, and therefore it was decided that the chest with the Holy Cross should be kept in the monastery “Holy Trinity” which was under the authority of the Bachkovo monastery. And when the monastery here was destroyed in Ottoman times, the monks were killed and this piece of the holy cross remains buried somewhere in this area. Hence this grace is spread in this place. Some people are going to Cross Forest to find help for their diseases; other people are going to baptize their children, for whom they had begged earlier on that very same holy place. After drinking the water of the holy spring “Galabichkata” and praying on the holy cross on the hill many people received healing from various cureless illnesses like cancer, mute children started to speak, and many other miracles are described in the chronicle book of the monastery. The prophet Yordancho Dryankov discovered a holy spring. Tsar Boris III was told to dedicate a Cross weighing 33 kgs, like the age of Christ – The Saviour, in order to thank God for healing his sister Evdokia. Tsar Boris III decided that 33 kg was not enough and had a 66 kgs Cross made. Again the Cross was replaced by one weighing 99 kg. As they were wondering where to put the Cross, the prophet brother Yordancho noticed that a Christian woman carried two pigeons as a gift to Jesus Christ. He took them, prayed and let one to fly. It flied eastwards and landed on a nearby hill. They erected the cross there. When he let the second pigeon, it flew to the west – in the opposite direction and stopped on a rock, past the meadow. They started to dig there and found a spring, from which a healing holy water began to flow. Ignat Bedrov, in his book about Cross Forest, wrote about the restoration of the monastery in the 20th century. On 14 September 1909 for the first time after the liberation of Bulgaria the people of the village of Borovo again celebrated the day of the Holy Cross at Cross forest. In that book Ignat Bedrov also notes that since 1910 the people from Borovo started to rebuild the monastery. They were joined by many people from nearby villages. In 90’s the cross given as a present from Tsar Boris III was stolen and was missing for seven months. The priests found it with the following note: “We who stole it were three, two of us are dead and I do not want the same to happen to me. I give back the cross, and I hope God to have mercy and this shame not to pass on my children.” Then the cross was placed again in its position. According to Ignat Bedrov the story of the cross is different. In his book of stories of participants in the placement of the new cross he states that the cross was brought to the top by Colonel Penchev from the Bulgarian army, who sought healing for his sick 10-year-old daughter. When he came to Borovo and heard the story of the Cross forest he decided to donate the cross to help his daughter to recover. The cross was brought here in 1939 and stayed in this place 55 years. The construction of the church “Holy Trinity” began in 1953 and ended in 1956. Along with it are built rooms for staff and shelter for the night for about 30 people. Since 1968, however, due to bans on religious activity the site declined again. For five decades it was prohibited to visit this holy place. In 1988, the Christians were finally granted permission again to visit the Cross forest! The new life of the monastery “Holy Trinity” began in 1989. In 1995 was built the church “Shroud” which is located opposite the old church “Holy Trinity”. Behind it the chapels of the 12 apostles are arranged on both sides of the path which ends with the cross of Christ, where thousands of believers stop to pray. They light a candle in the church “Shroud of Holy Mary”, where the icon is considered miraculous. Nowadays what is left of it is a small particle that is embedded in beautifully decorated Cross, which is placed in a special place inside the temple “The Shroud of the Virgin Mary”. Here in prayer for forgiveness and healing miracles happen. Some of these are described in a little book that is sold in the church of the monastery shop. Other tales say that every rock on Cross forest is marked with a cross. So, don’t forget to pick up some pebbles when visiting this holy place. Unfortunately in Bulgaria there is no data collected relative to different kinds of tourism. So we can’t say for sure how many tourists visited Bulgaria or even just this pilgrim route because of thermal facilities or breath-taking Bulgarian nature or monasteries or so forth. Despite the lack of organized studies, different sources relate that the night vigil before the Cross holiday gather every year from 5000 to 7000 people who spend the night on the Cross Peak ground and find the long-sought answers, discover lost paths and directions, treat mental and bodily pains. 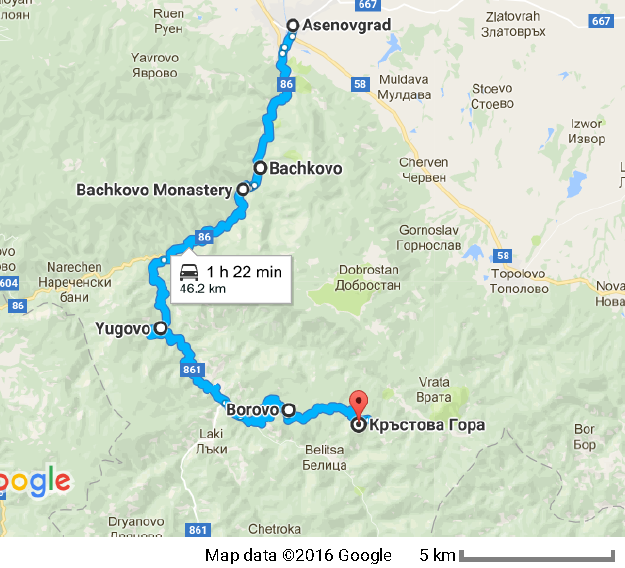 46 km of the Cross Forest pilgrim route in Bulgaria have been studied (Assenovgrad-Laki-Cross Forest and Mostovo-Cross Forest). The website performance of 62 accommodation facilities was analysed. Thermal facilities can be found in Narechenski bani. There are some route management hot spots. First of all there is very poor infrastructure. However, roads are under construction (see Figure12), which is a good step forward, although these roads cannot be wide enough to prevent risk of accidents. The analysis of website performance of 62 accommodation facilities showed some weaknesses. One is language barrier. Most of the websites are only in Bulgarian and very few have Russian and English version. The same problem was observed with flyers, books and guides. Most of the websites are not user friendly and not functional. People can’t book or pay for the accommodation facilities or other services. People can’t find enough information or even any information about the cultural pilgrim route Cross Forest or coming up events, fairs, festivals and so forth on accommodation facilities websites. On the other hand Bulgarian government realises that cultural pilgrim routes can increase the rate of local residents tourists and so to develop more sustainable tourism sector. That’s why many pilgrim routes are being developed lately. It would be better to work on attracting more Bulgarians to have a vacation in national resorts by developing alternative forms of tourism like cultural pilgrim routes. Our students projects under Cultour + project will help to regulate the degree of concentration and dispersion of tourism, the density of accommodation facilities, and to attract people to visit the Cross forest route by virtual 3D walking tours. All people visited Cross forest share their feelings that this is a place that makes you come again and again and doesn’t let you go! Стратегия за устойчиво развитие на туризма в България 2014-2030, link (10.07.2016). “Earth Summit”, Retrieved July 05, 2015 from link (10.10.2016). David Scowsill, President & CEO, WTTC, Speech, Retrieved July 05, 2015 from link (10.10.2016). Archimandrite Visarion, Sermon about Abbot of the “Holy Trinity” monastery at Cross forest, http://www.crossforest.com/ (10.10.2016). Channel BNT2, Patuvai s BNT2 Laki, Borovo, Krastova Gora, https://www.youtube.com/watch?v=R2X3gKYy30E (10.10.2016). Channel Posoki1, Na Posoki, Borovo y Krastova Gora 2nd part, https://www.youtube.com/watch?v=dxFzaZgz_N8 (10.10.2016). This entry was posted in Case study and tagged Cross Forest, Cultural Routes, local development, pilgrim routes. Bookmark the permalink.